Combine in-the-hoop machine quilting with coordinating embroidery designs to your next fall-themed quilting project. I’m happy to introduce this exciting fall-themed embroidery pack by Amazing Designs. The embroidery bundle includes 26 designs for 4″ x 4″ hoops and 14 designs for 5″ x 7″ hoops. The possibilities for Creative Quilting Outlines…Pumpkins with Style are endless. Join me to see how easy it is to use your embroidery machine for in-the-hoop quilting designs with these favorite fall projects. Adding color to your embroidery design couldn’t be easier with the five appliqué options in this design bundle. Align the fabric and selected design in the hoop. Back fabric with your favorite stabilizer. Trim away any excess fabric beyond the stitching line. Finish the edges with the beautifully digitized embroidery stitches. Get the look of a complex accurate quilting design using the computer guide feature of your embroidery machine. That’s right; you can quilt your next project in-the-hoop. Layer the quilt: backing, batting, and quilt top. Use spray adhesive to secure the layers. Align the area to be quilted in the hoop, matching horizontal and vertical register marks. Select the outline, or should I say quilt design, and stitch. I rarely just stitch one embroidery design on a project. Rather, I like two or three of the same motif for the design. This set allows me to mix and match many autumn motifs to create an interesting finished design. With designs for different sized hoops, we have options as to how big or small we’d like to stitch. The hoop will give you control over the larger sized projects, making quilts quite easily. You can mix embroidery designs flawlessly with the quilting motif, as the two are designed to complement each other. Consider repeating one single design on a mantle scarf. Three similar fall wall hangings make quite a statement with colorful detailing in each embroidered and quilted stitch. You can even dress up the entire table this holiday season with a table runner and placemats. This table runner features the embroidery designs on a 6-1/2″ center or focus block, which then gets a border (3-1/2″ on each side) and is set on point. The blocks are not complicated and you’ll be able to create them in any size. The coordinating placemats are equally easy to create by simply adding the fall embroidery designs to 6-1/2″ blocks, which will be sewn into a basic 9-patch quilt block and also set on point. If you are new to machine embroidery, you may want to watch Sewing With Nancy for more machine embroidery tips and ideas. Polish your embroidery skills by watching Machine Embroidery in Six Easy Lessons Part One and Machine Embroidery in Six Easy Lessons Part Two with guest Eileen Roche. On what type of stitched item are you most likely to add embroidery? Leave your answers in the comments section to be entered to win Creative Quilt Outlines…Pumpkins with Style. A winner will be randomly selected. The random winner of the CD Stress-Free Machine Embroidery: Diamond Spectrum Quilt is Shirley Clark. She said: Quilting would have to be the most stressful. I don’t have a machine that uses a stitch regulator and hand stippling is really hard, so using the embroidery machine is my best option. Thanks for the tutorial! Thanks to Judy B for the joke about the Frozen fabric. I’ve done embroidery on bibs, aprons, I’ve started a NY Star quilt as you go with embroidery. I think the most I have done has been on quilts and towels. I would emb the pumpkins on dishtowels, potholders, aprons, maybe even a tote bag. Table runners napkins and so much more. love the designs. I mostly add embroidery to towels and baby items. I am just getting back into machine embroidery. Thanks for the giveaway. I love making baby items. Seems every time I turn around I have another baby shower and it is fun to make unique gifts using machine embroidery and machine applique. I love machine embroidery and machine quilting it makes quilting and creating my art quilts fun. So far, I’ve done hooded towels/washcloths for baby gifts, a cloverleaf blanket (supposed to work with infant seatbelts), dishtowels, hand towels, and I’m getting ready to work on a quilt! Clothes are also on the list, in fact, I have a design set for a sweatshirt jacket – perhaps I should get that finished! I am trying to learn my first embroidery machine. Anything that would help me would be great. I love the fall season and these patterns are great!! Thank you for the chance to win them. I have done embroidery on my grandchildren’s clothes and quilts but now I am looking to use it on home decoration projects — some that can be done quickly. The pumpkins are great for ideas for October and November. Thank you for such beautiful ones that are so versatile. Adding embroidery to quilt locks and quilt labels are fun. Table runners are the best though, since you get to look at your handy work at every meal. Your pumpkin designs are great for the fall season. Wow! I am always amazed and how much we can do with our sewing and embrodering machines. Absolutely adorable! I’ve been doing machine embroidery for a while and am getting into more quilting but still consider myself a novice in that area. I love the idea of combining these techniques and am looking forward to doing small projects for family gifts and charity donations. I love the idea of quilting and embroidery together. I have made placemats using both! Thanks, for the opportunity to win these beautiful designs! Just got an embroidery machine and want to incorporate it into my quilting. I am just getting into embroidery and am doing mostly aprons for friends and granddaughters. I can see doing this on baby bibs and place mats. these are really nice designs. I like to embroidery anything especially T shirts. The small designs look so pretty on the little “mug rugs” and coasters. Also found everyone likes the embroidery on dish hot mats and pot holders. The design determines what I embroider on but mostly on clothing. Right now I’m embroidering Halloween theme on a wall hanging. Next is table runners, napkins and placemats. These are a very lovely design. I like making cards for holidays or birthdays! They look great and the receivers are so pleased with the personal touches you can give. I LOVE the pumpkin design! I would love to use it making a table runner with placements and a tablecloth. Its perfect for Thanksgiving and that is my MOST favorite holiday! Thanks for the opportunity to win that wonderful design pack!! I embroider on baby items, and kitchen items love giving them for gifts. I mostly do embroidery on home dec fabric and then make it into pillows. 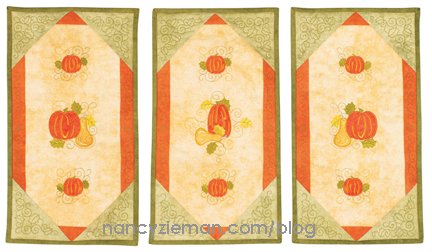 I would love to use these designs on table linens for the holidays. I love putting embroidery on pillow covers! Lately, I’ve been using embroidered squares for special kids’ quilts. I put the design on point in the middle, surround it with two square in squares and finish it with a log cabin-style border. Squares are 15-in. and the top is almost ready to come together — name “my favorite things.” Second embroidery currently is snowflakes on squares for Frozen-style quilts. They’re supposed to be white on white, but so far it’s been pink polka dot patches, or pastels to match the frozen fabric, which gets cold when you sew for a long time. I have been wanting to try quilting using my embroidery machine. Thanks for the ideas. A table cloth. Thanks for the chance to win. I love my embroidery machine and have just started doing some quilting. I would love this wonderful and exciting design pack. Table Runners are one of my favorite places to add embroidery. I do a lot of dish towels. I usually use a t-shirt but in this case I would use them in a table runner. I am very new to machine embroidery but so far am thrilled with the results. I love the fall designs, especially the use of tablecloths and napkins. I have an idea for a basket and bag using the embroidery designs to make them extra special and fun for the holidays. I love to embroider everything. I like to put embroidery on items for my grand-daughter. I make a lot of greeting cards using embroideries on stabilizer and scrap material. I am making small wall hangings now since multiple surgeries on my mid and upper back have made using my arms difficult. I used to quilt my quilts with my sewing machine and I am thinking of trying embroidery to quilt my small wall hangings. This would be a great way to start! Thank you for sharing your knowledge and for the give away. Almost anything I sew is decorated with machine embroidery! Everything from clothes to home dec and quilts. I love the mantle scarf idea. It’s simple and elegant. I most often add embroidery above hems on clothing, napkins, table runners or decorative items. I am most likely to embroider on matching shirts or dresses for my granddaughters and their dolls, and sometimes for myself as time permits. I am a newbie to machine embroidery. I love embroidering on ready wear, towels and placemats right now. I would love to make a table runner next. I mostly enjoy doing towels. Kitchen towels are a favorite and I love giving them as hostess gifts to friends. I also have enjoyed my designer handbags with the embroidery embellishments. I am just finishing up a fall table runner. The pattern did not include embroidery but I added some acorns in the corners. I would love to win the prize. I enjoy doing placemats, candle mats, napkins, etc. I love making gifts and small items to give away. I recently “adopted” an assisted living facility to give residents items to decorate their apartments for the seasons and these beautiful fall motifs would be perfect for that. These designs would be perfect for placemats, matching napkins, and silverware holder. I add machine embroidery to quilt blocks. I’d love to win this design pack! I love embroidering table runners as they can change the look of your table or counter top . This package look so versatile & fun!! I would love to make the triple banner wall hanging. The possibilities are endless. I love in the hoop designs. I love doing place mats, table runners and towels for the kitchen. They make great gifts for friends as well. I also like doing pillows to change with the seasons. I love doing placemats, table runners and towels for the kitchen. They make great gifts for friends as well. I also like doing pillows to change with the seasons. What beautiful designs for autumn! I like to embroider on home dec projects such as towels, placemats, and pillows and I also embroider on clothing. I have never tried machine quilting in-the-hoop and would love to learn this technique. Thanks for the fantastic giveaway. I an planning to add embroidery to kitchen towels. I have purchased huck fabric and am going to start from scratch. I have done many designs on blocks for children’s “I Spy” quilts, as well as tote bags which become two gifts in one. I embroider mostly gifts, such as towels, table runners, napkins, totes. I love the pumpkin design! I often do embroidery on gifts, such as towels, table runners and totes. Love the pumpkin design! I embroider mostly on home dec items. I especially love fall decor becausse of all the earthy colors. I love embroidery on Home Dec items, but also, children’s clothing. Nancy has the most fun stuff and easy ways to accomplish everything she does. Fall is my grand daughters favorite time of the year. I’m going to add to her pumpkins & fall leaves with a new table runner along with some dish towels. She will be able to use them every year to come. Since I am a miserable failure at free motion quilting, using my embroidery machine to quilt is a lifesaver. I would use these designs on a fall themed quilted wall hanging. Thanks for the chance to win. I wish I had this set now. Working on a PUMPKIN Themed quilt for my local guild’s quilt show and this embroidery would work really well with my rows of blocks. The projects shown really show off the set. I would use these embroidery designs on table runners, placemats and napkins. This would bring my holiday décor together. I have done towels with embroidery and it wasn’t as hard as I thought it would be. I love to embroidery on my table runners for that added spice. I occasionally do clothes for the grankids. I also quilt and have ventured forward with embroidery on them. I do love the in -the- hoop designs. Thank you Nancy for the giveaway and all your talent. I would use them to make pillows and table runners for the season. Perhaps some kitchen items as well such as hot pads, appliance covers, etc. I embroider mostly on clothing, but after seeing these very cute designs, I may have to give home dec a try! I enjoy embroidering just about anything. I especially enjoy making quilts and home décor with embroidered accents. Enjoy machine embroidery on infant and children’s ready to wear clothing; hand and kitchen towels; and hot pads. All also make quick and easy gifts. I love to make wall hangings! I change them with the seasons and even in between seasons. How nice this looks on a Fall hanging! There is an areaof weakness in my life: QUILT LABELS. I’d like to see moire creativeness and a lesson. Thank you Nancy and staff for the things that you do. Thank you so much! I am so thrilled to win. I love your blog posts, and I loved meeting you in 2013. I would love to embroider these on a tee shirt or jacket for fall themed addition to my wardrobe!!! I embroidery mostly on kitchen linens, dish towels, napkins, table runners, guest towels, also pillows, and quilts. I use embroidery designs on throws, pillowcases, and bags. I love to machine enroidery. How does one enter to win the autumn DVD? I just got this email today and see there is already a winner. Great looking designs for fall. You did it again–got my creative juices flowing. I use embroidery designs and embroidery quilting designs all the time on my placemats. They come out so lovely and are always a unique design. I especially like the Rambling Roses and Falling Leaves designs by Amazing Designs through Nancy’s Notions. Now the fall Pumpkins would be a wonderful addition to my collection. Love the designs and fantastic digitizing. These pumpkin designs would be lovely on napkins and placemats. Fall is such a colorful time of year. I would like to do a mantle scarf for my mom. I embroider on towels, totes, table runners, quilt squares, anything I make gets a little touch of “fancy”. I would love to win this to add to the possibilities! I would use these designs on a table runner and placemats. What a great fall collection with so many possibilities. I enjoy making napkins with decorative corners for holidays. In addition would be placemats and tablerunners. The open designs in this collection would also be great for kitchen and guest hand towels. I usually add embroidery to pillows. My Granddaughter has been helping me with projects and they are easy to complete in an evening. These pumpkin designs would be great for the Holidays!! Thank you for the opportunity to win!!! Bibs!! Plan to do more embroidery of quilt blocks and outline embroidery quilt designs. I think the embroidered pumpkins would look great as cornerstones on an autumn table topper. Love to add n embroidered accent to Place mats and coffee rugs. Sometimes to special clothing pieces too. I would like to try embroidering quilting motifs. I am thinking that I am going to start off with a small project like placemats. I’m really hooked on embroidery! I’m using it in quilts and ready to wear clothes. My next project is embroidery on my cardigans. I would start out by using it on a wall hanging. Using my machine to quilt is something I’ve been wanting to learn for quite some time and would love this opportunity. How did you know I’ve been looking for a pumpkin quilting design?? Love it! I would use these designs to make a wall quilt for my foyer. It is wonderful to see designs for the 4×4 and 5×7 hoop. In the past I have put some embroidery on towels, dish towels, doll clothes, table runners and quilts but prefer doing the smaller items the most. These fall embroidery designs would be great on a set of place mats. Thank you for the opportunity to win this. Home dec items, my last thing I embroidered was my sewing machine cover. I would most likely use this design on quilt blocks. New to embroidery and would love to make the table runner and napkins. The answer to your embroidery question is the SATIN stitch! Have a great pumpkin day! I just love the open designs and how easy it will be to place them. I would use them for a tablerunner, napkins, and wall hanging.